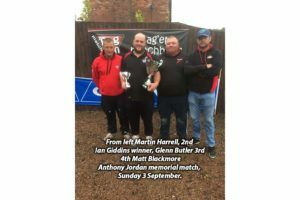 50 anglers supported the Anthony Jordan Memorial Match, fished on the Match and Specimen Lake. Conditions were wet & windy and it was the Match Lake that produced the big weights. Winner on the day was Ian Giddins (Bag’em Baits) who drew peg 24 on the Match Lake. Ian caught all his fish on the method casting close to the island and weighing 150-01-00 of quality carp. 2nd on the day was Martin Harrell (Larford Bag’em) who drew peg 14 on the Match Lake. Martin fished bomb & pellet landing 148-15-00. 3rd placed Glenn Butler (Marukyu) who drew peg 20 on the Match Lake. Glen Fished bomb & pellet and down his edge to weigh 134-10-00. 4th on the day was Matt Blackmore (Garbolino) who drew peg 48 on the Match Lake. 6th on the day was Danny Baker who weighed 105-12-00 from peg 20 on the specimen Lake. Danny fished bomb & pellet and later down his edge.